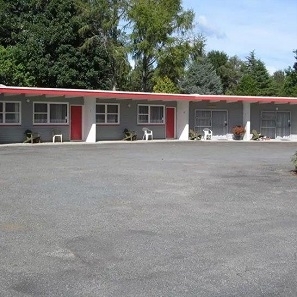 11 spacious ground-floor units (all non-smoking). 3 studio, 2 x 1-bedroom, 6 x 2-bedroom units (sleep 1-6). Full cooking facilities in all units. Continental breakfasts available. Guest BBQ area. Sky TV. WiFi. Ample off-street parking. 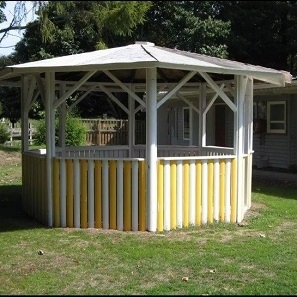 Rural setting on northern edge of Tokoroa, 3 minutes from town centre and restaurants. Close vicinity to golf courses, sports and recreational facilities, indoor swimming complex and scenic walking tracks (Te Waihou, Maungatautari, Waikato River). Central location for day trips to Taupo, Rotorua, Hamilton, Tauranga and Waitomo Caves. Visa & Master Cards accepted. Member MANZ. 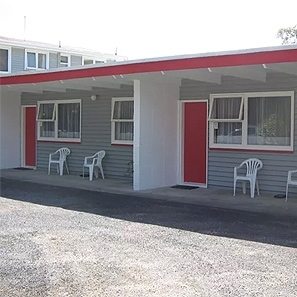 Redwood Lodge Motel has 11 smart and spacious ground floor units, all with full cooking facilities, and is close to golf courses, sporting and recreational facilities, an indoor swimming complex and Te Waihou, Maungatautari and Waikato River walking tracks. Its situation on State Highway One makes it a convenient base for taking day trips to Taupo, Rotorua, Hamilton, Hobbiton, Tauranga and Waitomo Caves. The nearby Mamaku Ranges rise to over 600 metres and are home to the Kaimai-Mamaku State Forest and Kinleith Forest. Here you can find kauri trees growing at the furthest southern limit of their natural range. Tokoroa is a timber town at the heart of the massive New Zealand forestry, timber and paper industries. Visitors can follow the Talking Poles Trail through the town centre to learn about the history and people of Tokoroa. These days the area attracts thousands of visitors to car rallies and mountain biking events.